Johnson Controls is the Smart Building partner for Quicken Loans Arena, helping to ensure a safer, more comfortable and connected environment for the fans and staff inside the arena today and in the future. Advanced technologies and integrating multiple building systems for smarter, safer, more efficient operations are creating intelligent, future-ready facilities – including sports and entertainment facilities. Stadiums and arenas today serve as multipurpose facilities set within entertainment districts. Whether home to multiple sports teams, transformed for concerts, or ready to welcome rodeos and monster truck rallies, these venues must ensure fans not only enjoy the event but are also safe, comfortable and connected. No one wants to sit through a game or concert that’s either uncomfortably warm or cold, too noisy or not loud enough. Meeting these goals requires the implementation of smart, connected building solutions that simultaneously contribute to improved energy and operational efficiencies. A clear goal for stadium and arena management is to provide a high-quality experience for fans, while also improving energy and operational efficiency. Ensuring efficient facility operations can directly affect the experience that fans have, especially when systems are successfully integrated for a holistic view into stadium operations. The convergence of building, business and venue systems requires that previously siloed entities are connected for a comprehensive systems environment. Systems can then communicate, share and optimize data across technology platforms that are managed on a unified, secured and resilient infrastructure. For example, building automation systems (BAS) can connect HVAC, security, fire protection and lighting systems, which enables more control, better automation, more efficient and sustainable operations, and ultimately increased comfort and safety for fans. The BAS can help automatically adjust the temperature in the venue based on certain variables, such as the actual attendance at each event, ensuring a comfortable atmosphere in occupied locations while limiting energy usage in unoccupied areas and reducing associated costs. Real-time data of energy consumption levels can then be analyzed to provide predictive analytics and feedback as needed. This information can be leveraged to define sustainability priorities and strategize future updates. In Ohio, Quicken Loans Arena (The Q) – home to the National Basketball Association’s Cleveland Cavaliers – is undergoing a major renovation called “The Q Transformation.” With Johnson Controls as its Smart Building Partner, the nearly 25-year-old venue engaged Johnson Controls to provide connected and efficient building systems and technologies for the arena’s renovation project, including HVAC equipment and fire systems. These systems will allow the venue to deliver energy and operational efficiencies, enhance the experience of visiting fans, and provide a positive impact for the city of Cleveland, the community, neighborhoods and the region. Since it’s opening in 1994, the arena has leveraged Metasys® BAS from Johnson Controls to monitor and control building systems and drive energy and operational savings. Metasys provides facility operators with key building performance data, and allows them to identify or correct issues more quickly before they impact building efficiency or fan experience. Chiller Plant Optimization, powered by OptimumEnergy and Metasys®, which ensures the central plant’s major components work optimally together to maximize energy efficiency and help optimize the arena environment. The arena has also signed a professional service agreement with Johnson Controls to provide lifecycle services, including the maintenance and service of mechanical systems, building controls, and security and fire systems in Quicken Loans Arena and practice facilities. This will help prevent unexpected system downtime for uninterrupted operations, while reducing operational and maintenance costs. 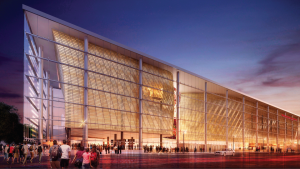 The Q Transformation is modernizing Quicken Loans Arena, ensuring it maintains its world-class status, creating a safer, more comfortable and connected environment for the fans and staff inside the arena today, and far into the future. By working with a trusted partner early in the process to discuss desired outcomes and strategize on beneficial technology integrations, venues can prioritize fan expectations and energy and operational efficiencies with the implementation of smart, connected and sustainable solutions.